Join us, We Learn Thai Chiang Mai, on Sunday Aug 30th. White Water Rafting and an Afternoon Sitting Along the River Eating Grilled Chicken and Papaya Salad. White Water Rafting Provided by Peek Adventure. – International standard safety equipment. 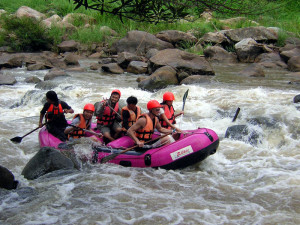 – Experienced guide and crew members. – International foods with fresh fruits, drinking water, tea&coffee. -Bring Some Extra Money for Eating and Drinking Along the River Afterwards.